Welcome to Twin Hills Country Club! PGA Junior League Registration is open for team Twin Hills! We have a great program for players 13 years of age and under. Call the golf shop for more information and sign up today. Clubhouse and Driving Range are Open 9:00 AM – 5:00 PM. Course will be open Thursday March 28th for walking only. We hope to have carts for Friday! Book tee times online or give us a call in the shop!! Located on 130 acres of lush, rolling hills, Twin Hills Country Club offers great rural golf yet it is convenient to our Capital City of Hartford and The University of Connecticut. 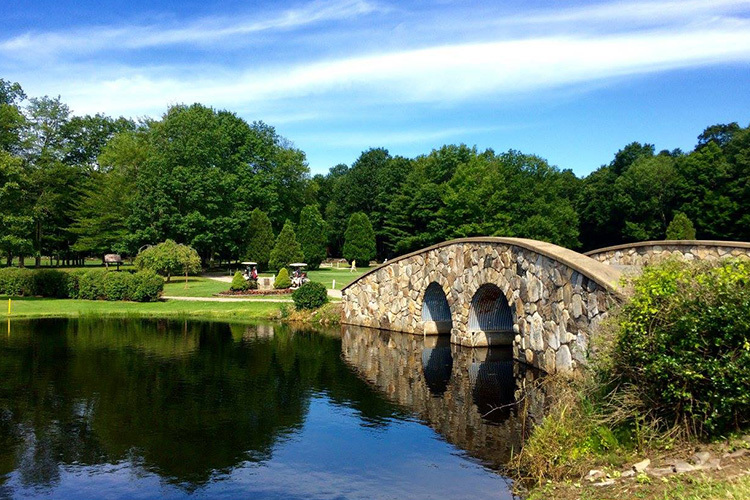 Twin Hills offers a beautiful setting with the country charm of stone walls, a covered bridge and its signature stone bridge located on hole #3. Come join us at Twin Hills and become part of the family! Copyright © 2019 Twin Hills Country Club All Rights Reserved.